Manyang arrived at the gate of WFSS with just a small bag in hand. “I heard that the school was open, so I came to see if it was true.” Though our men’s dorm was already full, we didn’t feel we could turn him away. At 24 years old, Manyang says this is his last chance for an education. Though he is married and has 2 children at home, he has enrolled in our Senior 1 (9th grade) class. In addition to his own children, he also has his brother’s children and his mom at home to care for. Manyang came on faith that we could help him earn his school fees and some extra money to send home to his family. Students at WFSS have the opportunity to put their agriculture lessons into practice and earn some money. Students attend class from 7:30 am – 4:20 pm. After class they can work on their garden plots. The crops they raise are sold in town or purchased by the school for school meals. Students track their expenses, and the profit they make is theirs to use as needed. Some will pay school fees, others will save for college or business in the future and still others will enjoy having some pocket money for the first time in their life. This unique agriculture practicum is what Manyang is counting on to be able to complete his secondary school education. 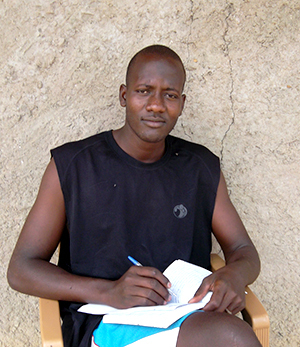 Without an education, men like Manyang are left with few options. Most join the military, which is a very rough and dangerous life. Manyang says that his favorite subject is chemistry, but he likes math and English as well. He hopes to be able to attend university when he graduates, though he isn’t yet sure what field he’d like to study. Thank you (Janzen) for the great work you are doing in XXXXXXXX. God bless you abundantly. We are incredibly touched by Manyang’s story and so proud of him. We will be lifting him up in prayer. As Peter said, thank you for the great work you are doing. You are loved and making an eternal difference!!! May God richly bless you and all of the wonderful people you have the privilege of serving each day! Thank you Janzens for great work at WFSS. I am amazed with what you have done in short time. You and Samuel Agot are doing wonderful job. Keep up the good work and Almighty God will bless you. Dan and Teressa, continue the good work that you are doing. Many people’s lives will be transformed and communities will be transformed resulting in a better nation that knows and fears God.